Hello! I'm so excited to sharing a little something I've been working on here at home this year. When I was on maternity leave after my daughter was born in 2010, I made myself print and organize all the photos that I had stored on my computer since my son was born in 2007. Since then, this is about the extent of what I've done with them. Yep. Sophisticated storage system, huh? I had to do something. I don't have a ton of time and I like making cards because it's quicker than scrapbooking. I also felt intimidated, like my photos had to be perfect for a 12x12 layout. I caught myself obsessing over matching the outfits my kids were wearing to the layout and nothing was getting done. Enter Project Life. Project Life is designed to be fast and user friendly. This is exactly what I needed to do. As promised, here are some photo shots of my Project Life layouts in action and a little about how I start them and some of my favorite tips and tricks. One of my favorite tools for Project Life are my 3x4 journaling card dies. These fit the pocket pages perfectly. They also allow me to crop my photo perfectly and I can see exactly what my picture will look like. It's also great when I have an adorable picture of one of my children and the other looks *ummm* awful. (grin). I do the same thing with the new Lawn Fawn #awesome Instagram frame die. When I'm working on a Project Life Layout, I like to start with getting my photo pockets filled with photos first. You can put in as many or as few as you want, that's one of the things I love most! Here I've basically saved myself 2 spots where I'll scrapbook. Since I don't always have a ton of time, I will do this just to get my photos in the albums. I find it keeps me less behind this way and I'm less likely to end up with a box of photos in my laundry room for months! Like I said in the video, I absolutely love the Project Life Lined Journaling and Grid cards. I use these as a standard for my layouts. Next is the title. A good (scratch that) great alphabet die is a must. My favorite is Avery Elle's Avery's Alphas. It is such a great basic. This trick saves my crafting budget in the long run since I don't have to invest in alphabet stickers and instead I can make my own with any color of cardstock I want! To add adhesive, I simply run them through my Xyron! Here I die cut the frame and photo as well as the title to create the beginning of my 4x6 pocket insert, now I just get to embellish it! I give a little washi look, I trimmed down a piece of patterned paper. I stamped and die cut the little camera from the same Lawn Fawn #awesome set. Then I colored it in with Copics, adhered it to my 4x6 layout and stamped some of the hearts using Avery Elle Raspberry and Orchid ink. And a few hearts for some fun. I always like to make sure I have something 'grounding' my photos. Now I'm ready to add some journaling and put it into the pocket. I followed the same basic idea to do my son Parker's. A few die cut shapes and his name using the same alphabet die. I adhered them to my 4x6 journaling card and trimmed any overhang. Since these are on the same page and since I love it so much, I used the same Lawn Fawn #awesome Instagram frame die. I just love how little the pictures are yet they are still highlighted so well! Again, I used more of that same patterned paper (Lawn Fawn Hello Sunshine 6x6 pad) and simply tore it on the ends to give it a washi tape look! Sometimes I like to make simple journaling cards - here I'm using a 3"x4" piece. I added a strip of patterned paper and die cut the word love and a few hearts. What I love about this is that this allows me to use all of my card making supplies and I don't have to invest a lot in premade journaling cards. Don't get me wrong - there are a ton of fabulous ones but I really enjoy being able to make my own! Here's the end result for one layout. Thanks so much for stopping by the CLASSroom today and sharing part of your day with me! 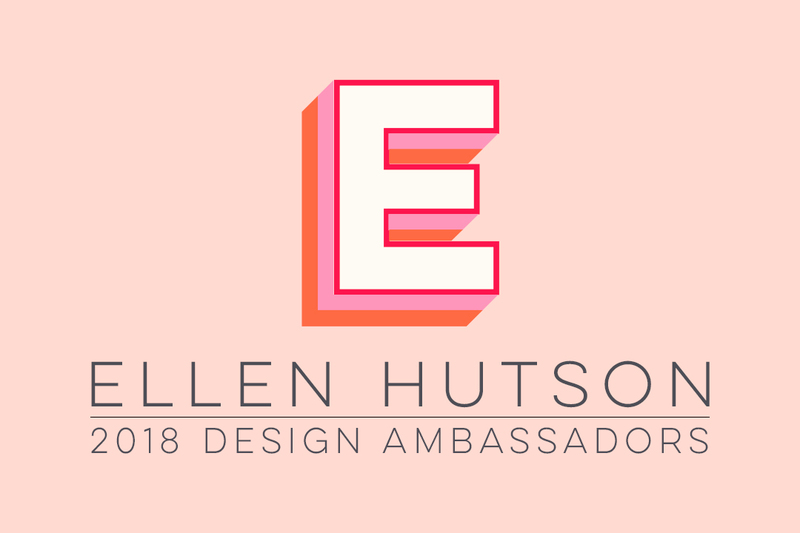 One of the things that is most important to me is that we provide the best education and inspiration to all those of you who support us here at Ellen Hutson LLC. It is with much excitement today that we announce two wonderful additions to our design team as they join our fabulous group who inspires and educates here on a regular basis in the CLASSroom! Heather Campbell lives right here in the Pacific Northwest - her cheery smile warms my heart each time she stops in here at the office! Thank you Heather for your willingness to help on the spur of the moment and always going above and beyond! As a Paper Crafts magazine Go-to Gal, a member of the Avery Elle design team and a mom who works, we are so very lucky to have her here as well. You can find more of Heather's clean and simple work on her blog Parker & Molly. Heather will be contributing every other Wednesday here in the CLASSroom, so be certain to stop by and leave her comments from time to time to cheer her on. Please help us welcome her today both here and on her blog, Parker & Molly! As our way of thanking you for taking the time to do so you will have two chances to win a $25 store credit - one here in the CLASSroom and one over on Heather's blog! Please do so before Monday, November 18th midnight Pacific Standard Time to be a part of our random drawing. Hello everyone! Heather here and I am thrilled beyond belief to be here today as an official part of the CLASSroom! I am so excited! For my introductory post, I thought it would be appropriate to do something that is extremely my style. I have a confession. I love journaling cards. One of my favorite tricks these days is creating my own journaling cards and the Technique Tuesday Story Card dies make this so easy! I die cut my journaling card and stamped the snowman from Good to Snow by Technique Tuesday. Then, I stamped the background of the journaling card using Hero Arts' Tiny Ink Spots DesignBlock, using the same masking technique to keep the snow of the snowman and on the ground white, putting the snowman in front of the falling snow. I added some snowflakes using the same Hero Arts soft pool ink and stamped my sentiment. One I had my background done, I peeled off my masking paper and added paper pieced the scarf, earmuffs and heart. I also outlined the snowman and the snow with my lightest shade of blue copic marker to make them appear extra white. Ta-da! Journaling card done and it's so cute! I could have easily made this into a tag but I really wanted to put it on a card. I stamped some of the snowflakes on kraft and then wrapped it with twine. Here's how it looks from behind. I used washi tape to secure it on the back so the knot wouldn't cause any lumps. A strip of the new My Mind's Eye Mistletoe Magic decorative tape and it's adhered to the card and I love how it sits nice and flush to the card. Thank you so much for stopping by the CLASSroom today! I'm thrilled to be here! Today I'm stamping with Ranger Ink's Distress PAINT (not the Crackle type, the water-based acrylic) on kraft card stock. I'm impressed over the opacity of the colors on this type of card stock--the colors remain vivid and bold. Yeah, yeah... I'm into bold lately. Some day mebbe I'll get into a "delicate" mood. But, today is not that day. BAH HAHAHAHAAAA!!! Keep a water-filled mister bottle handy to spritz your stamp immediately after stamping; it helps keep the paint active and while you set your project aside to dry, you can spend a minute getting your stamp cleaned right away so the paint doesn't gunk up permanently in the crevices. All in all, the Distress Paint is quite fun to work with, and I'm amazed at how the surface of the paper does not change at all! With most paints, you can feel the texture of the paint on the surface of the paper but these are almost completely imperceptible when you rub your fintertips across the top! Waaaaay cool! Enjoy the video here or hop-skip over to YouTube and check it out there! Thanks for subscribing! Happy Mundane and thanks for watchin'! You know me. I don't like to get my fingers inky. I'm kind of an oxymoron in the stamping world. Hah! But, I love color--bold, sassy, eye-poppin' color! And, that's what you get with Dylusions Sprays. I will admit, however, that I wore gloves. And a full body apron. And I protected my work surface under the camera. Cuz these sprays, my friends, are very inky business...!!! But, oh, my they are wicked FUN!!! By the way, I got myself a new non-stick craft sheet... I didn't know that if you FOLD them, you "break" the glass fibers. This causes wet mediums to LEAK. BOO. So, I got a new one, so I could stuff like this, and now that I know better, I will never fold it for storage; I will roll it up and clip it. Don't forget to subscribe to our YouTube channel and thanks for joining me today! We are thrilled to welcome Teri Anderson back to the CLASSroom! Her joyful crafting style can be seen in the new line of stamps she has created for Technique Tuesday - I absolutely love the bold, clean and simple lines of her designs! As well you will continue to find her madly (now I saw madly, because I would quite frankly be losing my mind trying to keep up with this pace - LOL!) creating 25 cards in 25 days on her blog a bit of this. a bit of that. You must head over to be inspired! Now how she does this all, simulatenous with being a PaperCrafts Go-to-Gal, and doing design work for Lawn Fawn, Paper Smooches and Technique Tuesday I'm not quite certain, BUT she has also shared her creative genius with us here today!!! Thank you Teri for sharing another clever creation with us here today - I absolutely LOVE your twine wrapped trees!!! Hi everybody! So happy to be back in the CLASSroom today with a tag for the 12 Tags of Christmas with a Feminine Twist! I have to admit that one of my favorite activities during the holidays is to hit the holiday craft fairs. I just love seeing what other crafters dream up. Something that caught my eye at recent craft fair was a set of homemade Christmas trees. These clever, fun and funky trees were wrapped with yarn and fabric. It was just so fun. I loved the look so I decided to show you how to make your own fun and funky trees with Baker’s Twine for today’s tag. Cut the triangle out with your scissors. Place a mini Glue Dot on the bottom of it and start wrapping green twine from Doodlebug’s Baby Girl Twine Assortment around it. Keep going (and going) until your tree is completely covered with twine. Place another Glue Dot on the back of your tree and place the end of your twine piece in it. Repeat these steps. This time, make a second triangle a little bigger. And then wrap the second tree in pink twine. When you are finished, you’ll have something like these two trees. Set the trees aside and cut two squares from white cardstock. They should be large enough to fit across a #8 sized tag. Cut a curved line through each square. Arrange the cardstock pieces to fit on your tag so it looks like there are hills of snow. Use Crystal Stickles glitter glue to add a line of glitter along top of each curvy hill of snow. Place the trees on the snowy hills. with Spun Sugar Distress Ink onto a manila tag. When you stamp, be sure not to rock the stamp so you get nice, clean impressions. Stamp Joy from the December Daily 2012 stamp set on white cardstock with Onyx Black ink. Fussy cut the word out and adhere it to your tag. Stamp “celebrating” over the adhered word with Onyx Black ink. Tie twine through some green buttons and adhere them to your tree with Glue Dots. Give your trees one more funky touch: Randomly adhere some Diamond gems on top of them. Add some accent pearls randomly the top of the tag near the snowflakes. Finish your tag off by tying a little twine through the top of it. And ta-da! Thanks for joining me today and letting me be part of your day! We would very much appreciate you sharing your appreciation with Teri for her oh so clever and fabulous feminine tag in the comments section below! Leave your comment below to be eligible for the random drawing of the $25 gift certificate to our store www.ellenhutson.com - be certain to do so before noon on December 13th to be eligible (one comment per person please.) Can you believe we are already half-way through our series?!? Be certain to return tomorrow for yet another beauty! I love a lot of different things, so whenever I'm asked what "my style" is, I struggle sometimes with defining it. This design is an example of wanting to create a "vintage-looking" embellishment or focal point, but executing the overall design with the clean and simple style I'm so fond of. The Savvy Stamps 3D Star Die was my starting point--I wanted to recreate the effect of a beautiful vintage ornament so I die cut the shape from a pretty collaged sheet from Basic Grey's Aspen Frost collection. It has score lines built into the design--you could use the stars flat, but I thought the dimensional look was a nice effect and gave this card a lot of visual "pop"! I actually cut a bunch of stars all at once so I could use them later on different projects--I think they'd be darling to dangle on gift packages or to make a garland. I did reach a point where I debated on whether or not to add "one more thing", cuz y'all know how going down that path can subsequently lead to the circular file, but in this case, one of my favorite stand-by tricks polished the card off perfectly. Thanks for joining me this Monday! Have a gooder! Yay for World Card Making Day! My challenge for you today is to create a Holiday Greeting! I mounted all the sentiments I wanted to use onto one single acrylic block--this initially took a little time, to make sure they were all straight; an acrylic block with grid lines really helps! This way, I could ink and stamp all at once, making mass production of this design a breeze! It was then very easy to "fill the gaps" with the darling accent images in the set like the bell, holly and stars, in different colors. A little bit of twine and some Rock Candy Stickles was all that was needed to finish it off! Can't wait to see what Holiday Greetings you create and thanks for joining me in this challenge for World Card Making Day! We hope that this challenge helps give you a jump start on your holiday cards! Create a card to use this upcoming holiday season! Once you have completed this challenge please be certain to link directly to that specific project in our WCMD Challenge Blog Candy post! What is your favorite time of year to pull out your card making supplies and create? One of my absolute favorite aspects of going to the Craft & Hobby Association shows is having the opportunity of meeting the many incredibly talented women in this industry. It was with great excitement that I finally had the opportunity to meet Teri Anderson at the last show! This talented young lady is one of PaperCrafts magazine Go-to-Gals. As well she is a design team member for THREE of fabulous stamp companies we carry - Lawn Fawn, Paper Smooches and Technique Tuesday! It is such a pleasure to have Teri with us today showing us a fantastic way to use circles in designing a card! We would LOVE to have your help thanking Teri - please head over to her blog a bit of this. a bit of that. and leave some lovin' in the comments section of her post there - you know you are in the correct spot if you see the following pic! Thank you Teri for sharing your creativity with us here in the CLASSroom! Hi Everyone! Welcome to the CLASSroom! Circles are one of my favorite design elements on cards. I want to show you a few fun ways to incorporate circles on your cards with stamping and with using buttons by sharing this card with you. First thing is first. I'm going to do some stamping and make one really big layered circle. I just love using circles in this! I started by cutting a 2 1/2" circle from Bayou cardstock. I used a circle punch, but a circle die would work just as well! Then I stamped the "gratitude" definition from The Family Circle on to the circle. You'll notice that I stamped it just a little bit off the circle. That's because it really is just a design element. I don't expect anyone to actually read it. I set the circle aside and then grabbed the Thanks circle and stamped it with orange ink on white cardstock. I used a circle punch to cut it out and then set it aside. Now comes the hard part! (Hee hee!) I used the large circle stamp from The Family Circle and stamped it with black ink on to my card panel. Here's how it looks all stamped up. Easy, right? Then I just started piling things on. I added the Bayou circle and then I added the Thanks circle. To give a little extra dimension, I used foam tape to pop that small circle off the card. Here's a peek of how things look when all finished. Love that extra pop the foam tape gives! Another nice way to add circle elements to your cards is to use round buttons. I use buttons plain like this all the time. I use buttons plain like this all the time. But, sometimes I like to sauce them up. And Copic markers are a great way to do this. Just take a pen to your buttons of choice and start doodling with it. For my card, I selected three markers slightly darker than the buttons and then just lightly and selectively added color to parts of each button. If you try this at home, be sure to test it out on a few buttons first. That way you can make sure the colors work well together. The end result of my button doodling looked something like this. My buttons (plus some more I colored) look pretty cool on my finished card. As I sit here tonight reflecting on the past 18 years I am grateful - grateful for my two very special daughters! My heart is bursting with pride as we celebrate with our oldest daughter Maddi, as she graduates from high school today. I wanted to take this opportunity to pay tribute to the amazing young lady she has become. Maddi's kind and caring heart is probably the trait I am most proud of. The goals she sets for herself constantly amaze me and she works towards them with fierce determination, putting in the hours of work necessary to make them come true. Maddi, congratulations on meeting your goal of running a 1/4 mile in less than 60 seconds and setting a new school record together with your teammates in the 4x400 at State this year. Congratulations on your many scholastic achievements - to know that you love science and math as much as I do just makes me grin from ear to ear. You will do something amazing in life... of that I am certain! Creating this simple card was an absolute joy, because as I created it I was able to reflect back on the past and remember the moments of joy, tears, and laughter. Your quirky wit is definitely something you get from your dad - my goodness but you can make me laugh! We are so very proud of you as you head into the next phase of your life. Congratulations once again my sweet girl!!! TIP: It doesn't take much time at all to create a card for a graduate in your life. Use their school colors as your jump-off point. Apply Be Creative Tape to Solar White cardstock and cut out your numbers before applying glitter and burnishing. "Cap" it off with a mortar board and you are well on your way to congratulating someone special.